I’ve written rather extensively about Crown Center in Kansas City and the fun family offerings to be found there. 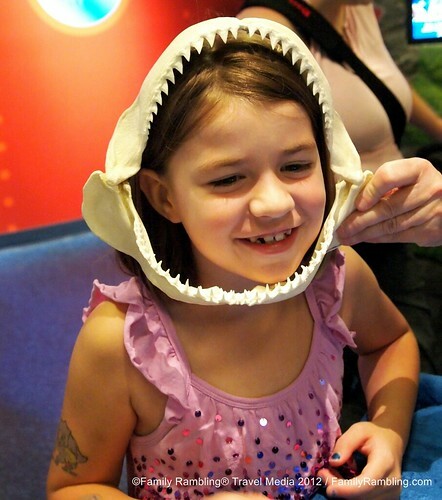 With the recent addition (summer 2012) of LEGOLAND® Discovery Center and SEA LIFE Aquarium, Crown Center has become the perfect destination in Kansas City for fun family vacations with ‘sneaky education’. Follow the Yellow Brick Road! Just one of the many incredible LEGO creations at LEGOLAND Discovery Center in Kansas City. LEGOLAND® Discovery Center and SEA LIFE Aquarium are both owned by Merlin Entertainments Group. In my opinion, you should purchase your tickets online. Not only will you save money, but you will be able to bypass the queue of people waiting to purchase tickets. You can purchase tickets through either the LEGOLAND® Discovery Center website or SEA LIFE Aquarium website. BUT- you need to know which you want to do first! 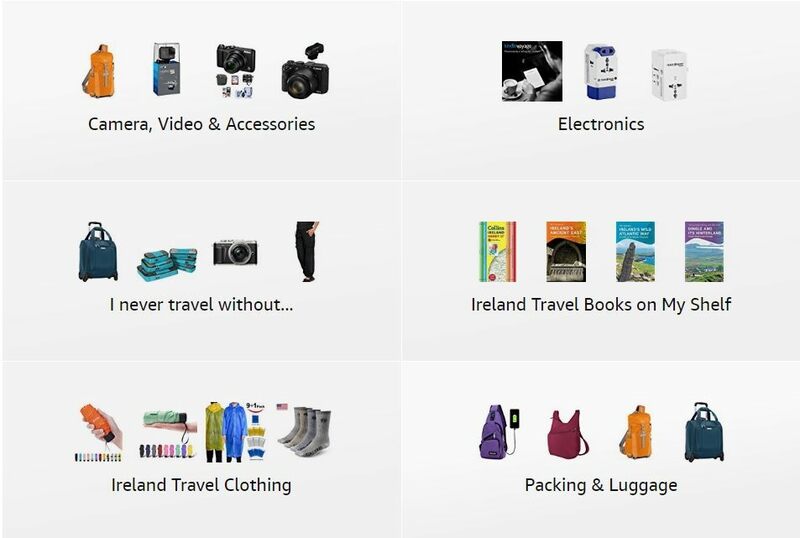 Whichever site you purchase through, you are required to visit first. The tickets for the second attraction are valid for 14 days- a terrific option if you don’t want to visit both in a single day. Be aware- the tickets will not be re-issued, so put them in a safe place where they won’t get lost! If you plan to visit both attractions in a single day- which is totally do~able- I would choose SEA LIFE first, just in case the kids really, really like LEGOLAND and don’t want to leave. If it is at all possible, visit on a weekday. Our visit took place the Friday before Labor Day weekend. We entered without a wait, wandered leisurely through the aquarium with plenty of time and room at the touch tank, and the only place we really had a crowd at LEGOLAND was at the ‘build a car’ area. I imagine the families who visited over the weekend didn’t have that experience, as the queue wound all the way through the barriers and beyond. Having been to the SEA LIFE Aquarium in Phoenix, Arizona, I admit I entered the Kansas City aquarium without much enthusiasm. I’m going to assume my visit in Arizona was too rushed, as our time in SEA LIFE Kansas City was terrific. Upon entry, the girls were given an activity sheet filled with fish facts. As we worked our way through the aquarium, we found the questions and made our answers. Upon completing the quiz, a prize was waiting. For the homeschooling mom in me, this was the perfect ‘sneaky education’ I try to find. After having our photo taken in front of a green screen, we slowly wandered through the first areas, taking our time to really look at the fish and talk about what we were seeing and reading on the signs throughout the aquarium. And then we reached the touch tank. As the only people there, we had all the time we wanted to ask questions, touch starfish and snails, and get up-close views with the underwater camera. The aquarium is set up to be entertaining and interactive, with lots of places for kids to wander through, “pop up” in and get hands on. The sting ray tank was especially fun as, occasionally, a ray would come to the surface and ‘wave’ his fin at us, splashing as he went by. We stood in the underwater ocean tunnel for quite a while, watching as the sharks swam over us and the rays ‘smiled’ as they went by. As you exit the aquarium, you enter a play area. Young kids will love climbing and sliding (note: bring socks!) while older children can touch and view assorted bones and cartilage from various sea creatures. Upon leaving this area, you have the option of purchasing a souvenir photo before entering the store area- which has both SEA LIFE and LEGO items. Plan for at least 1 1/2 hours at the aquarium; more if it is very busy or your child is very inquisitive about sea creatures. If you plan to visit both attractions, hold off making purchases (except souvenir photos) until you have completed your visit. It’s just easier to monitor the amount of money you’ll spend. If you don’t purchase your tickets online, the wait during a busy weekend may be quite long. After enjoying lunch at Fritz’s Railroad Restaurant in Crown Center- where your food is delivered by train!- we made our highly anticipated visit to LEGOLAND®. My girls have recently discovered LEGOS and adore the Friends collections. Tip: If your kids like to stamp things, purchase a stamp book ($4) as you enter. Stamp stations are located throughout the center and it is a fun and affordable souvenir. 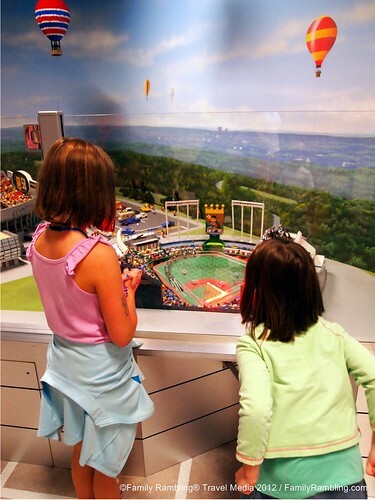 LEOGLAND® is highly interactive, beginning with the “factory” tour, where you learn how LEGOS are made, how many LEGOS tall you are and how many LEGOS you weigh. As you leave this area, you receive a very cool souvenir brick. Then the real fun begins, with the Kingdom Quest ride. You’ll be so busy shooting spiders and bats that you won’t realize when your souvenir photo is taken – and then it’s just luck on whether or not it is good enough to purchase. After the ride, you’ll enter Mini-Land, which is filled with Kansas City landmarks, a few of which are interactive. The Royals baseball stadium is very popular! 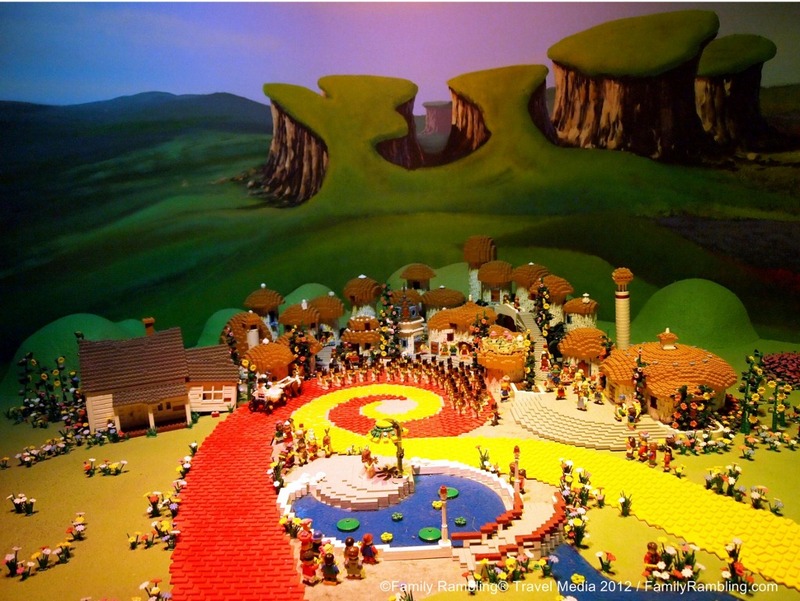 You’ll ‘leave’ Kansas City and land in Oz- complete with yellow brick road, castles, flying monkeys and a ‘melting’ witch! Near the LEGO® Cafe, where a kids meal is served in a large brick box, is a play area for the little ones, with fun LEGO® animals and DUPLO® as well as LEGO® ‘pools’ for your older builders. The 4D theater – the 4th dimension is touch (air and water)- has two rotating shows, while the soft play area is great for helping kids burn off energy (bring socks!). You’ll find plenty of places to let your creativity loose here… Girls big and small will have fun in the ‘Friends’ area with plenty of blocks in all sizes and a karaoke stage. For those who love to build and destroy, the ‘earthquake tables’ are especially fun- build your tower and see if it can withstand the shaking table! Building a race car is harder than it looks, but it’s fun to try at the LEGO® Racers area, where you can build- and then race- your car. But what my girls loved most of all was the Merlin’s Apprentice ride, where strong pedaling skills make you fly high. Because there weren’t many people there, they rode it 5 times! After the Kingdom Quest ride, you are free to wander the rest of the Discovery Center at your leisure, returning to each area as many times as you like. While all the activities are sure to keep the kids entertained, the real amazement for me- as someone who can barely create a 3 dimensional shape with LEGOS- was seeing the incredible sculptures. Exiting deposits you directly into the LEGO® portion of the gift shop. It is very easy to spend at least 2 hours here; more if you eat in the cafe. The LEGO® Racers area is crowded, even on a slow day. Master Builder Academy takes place every 30 minutes on a first come, first served basis. An extra fee many be applicable for the model kit. If you don’t purchase tickets online, the wait during a busy weekend can be quite long. 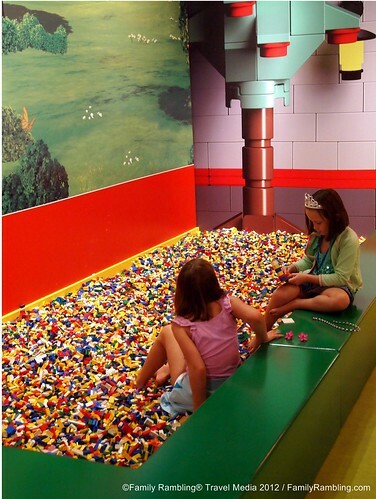 The queue has LEGO® blocks to help you pass the time. Crown Center has two hotels on property: the Westin and the Sheraton (formerly a Hyatt). I’ve stayed at both and, for visiting with kids, we choose the the Sheraton for one simple reason: they will let us book, and guarantee, adjoining rooms in advance. The Westin will not guarantee adjoining rooms. Both hotels offer package deals with attraction tickets. Crown Center and the surrounding area are filled with fun things to do. Nearby Union Station has a science center, train displays, the Irish Cultural Center and exciting traveling exhibits. Also across the street in the National World War 1 Museum and Liberty Memorial. A terrific stop for history buffs and students, you’ll see artifacts, weaponry, and plenty of displays to help you learn more about WW1. Hallmark Visitor’s Center and Kaleidoscope are both free and fun. The Crown Center area was built by Hallmark – their corporate offices are here, too- and these attractions offer a great hand-on experience and behind-the-scenes look at the company. Crown Center Square has Kansas City’s largest fountain- which is perfect for splashing in on a hot summer day- and also hosts many of the city’s largest festivals. Summer weekends also feature free outdoor movies, while winter activities include an ice skating rink. Inside Crown Center you’ll find plenty of shopping, theaters and dining. Crown Center has quite a few family friendly restaurants, including Fritz’s Railroad Restaurant and the Crayola Cafe. Panera is just over the street, and Harvey’s in Union Station offers a beautiful setting for relaxing meals. For more photos of LEGOLAND and SEA LIFE, and other Kansas City fun, visit my Kansas City set on Flickr. Have you visited Crown Center? What is your family’s favorite attraction? Where do you prefer to eat? Share your Crown Center tips in the comments! 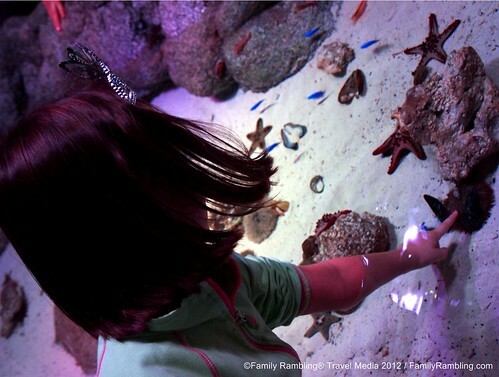 Disclosure: Our tickets for LEGOLAND® Discovery Center and SEA LIFE Aquarium were provided by VisitKC. 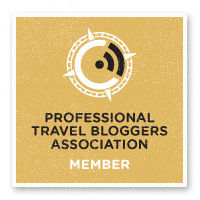 All of our dining, transportation and lodging were paid for personally.